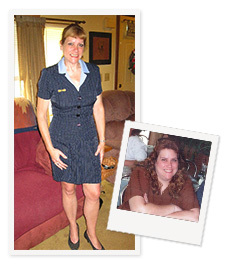 My health was deteriorating more and more each year, I was gaining extra weight year after year, and I had been highly depressed for several years prior to surgery. I had high blood pressure and heart issues; my feet were turning black and blue from circulatory problems; I was pre-diabetic; I had breathing difficulty, migraines, fluid retention, sore joints, bad knees; and I got sick often. In spite of all of the above, I was still as active as I could be, and it never really seemed that I was in such bad shape. It wasn't until the winter before surgery that it really hit me hard! I went hunting with my family as I did every year, but this year was different! I had to stop every 5 - 10 minutes, or every 5 - 10 steps if going up the mountain, to rest while walking. I felt like I couldn't breathe. Everyone felt like they had to wait for me, so not only was I holding myself back, I was holding everyone back, which made me even more upset. By the end of the day, I hurt so bad, I could barely walk at all. I was losing my quality of life. My emotions were all over the place and I refused to take medications because they made me gain additional weight. I finally came to the conclusion that I had to do something drastic to improve my overall well being. All the diets and gimmicks I had tried before had never worked for very long; I always gained the weight back and then some. I have always been the type of person who puts everyone and everything ahead of herself. After a lot of soul searching and a very close call with death, I decided that I had to change my attitude in order to save and improve my life. It was time to concentrate on me and do this for myself and not for anyone else. I started doing research online. I also talked to people who had different procedures and different results. I signed up for a Barix seminar/consultation meeting and decided Roux-en-Y gastric bypass was the right choice for me. My experiences with the (Langhorne, Pennsylvania) Barix Clinics were wonderful! I owe my awesome new life to my fantastic surgeon! Michele Chase, my surgeon's assistant, was always there for me, making me feel comfortable, answering my many questions and supporting me on the whole journey. I want to mention Irene at the front desk, who always welcomed me and my family with open arms; the girls upstairs; the respiratory girls who had to wake me up to do my treatments and were always so kind and understanding; and Nurse Michele, who inspired me, walked with me and helped me with my first shower and made me feel totally at ease, and reinforced that I would do well, and who got me hooked on mint teas! Nurse Tara was always so sweet, kind and encouraging! Deb Hart continues to be a great wealth of information, support and encouragement! The staff showed they cared about me and my success; it never seemed that I was "just another patient"! I actually looked forward to walking the halls and spending time with the staff. I even walked in the middle of the night without being told I "should." Yeah, they were that good! I simply cannot express how important every single person who works at Barix has been, having an impact on the excellent care I received before, during and after surgery. Oh my gosh, I have my life back, and it is better than it has ever been before! The health benefits came almost immediately. I was off all medications within the first month after surgery, and all the other medical problems I had? Gone!!! I went from a tight women's size 28 at 268 lbs to a size 4 and 135 lbs in 1.5 years and have stayed within a range of 6 lbs of that weight for over a year since reaching my goal! I have a whole new outlook on life. I have energy to burn, and now look back and can see how much my life was hindered by the excess weight. When we go hiking or hunting, I am now the one in the front waiting for everyone else, even with my 30 - 50 lb backpack & equipment on. I can walk backwards uphill while talking and stay ahead of everyone, and have no problems walking back out at the end of the day! I have also found so much more confidence, which has helped my part-time karaoke business as well as all the other aspects of my life! One of the most important things that this surgery has afforded my life...is my "Barix family." The friendships and bonds I have made through the Barix support boards have made me feel so important and cherished. There is no support group in my area, so the Barix board is my support group! We can address any subject and someone is always there for support and guidance. I continue to pay it forward by helping others on their journeys because it helps me to stay on track and accountable. I have been privileged to meet and bond on many levels with several other Barix patients, and I have many more I want to meet in person as well. First of all, do your research, check all of the different procedures, go to a couple meetings, go online, read, and go to a Barix seminar/consultation. Do a little soul searching to know yourself enough to decide which is best for YOU! My family and friends were behind me 100% until I got the approval--then they freaked. But after the surgery was done, they were right there again rooting me on. Of course people aren't going to understand everything you go through. The journey is not easy; however, it is totally worth every single step of the walk! That is also where the Barix support boards come in. We understand every single thing you are going through and will offer as much support and advice as we can. I cannot stress enough the importance of having some type of support to continue to be successful! My Motto: I am now eating to live, not living to eat!